﻿Rachael’s story: finally healing after traumatic birth, severe tearing, vaginal prolapse plus 3 failed repair surgeries. When we first met Rachael, she was resigning herself to living with constant pain from her first child’s traumatic arrival, after three failed surgeries to repair the damage, and dismissive attitudes from health carers. After two more children, and much emotional healing, she took steps to find out if there was a way to relieve these ongoing symptoms for good. Rachael with her youngest child. Rachael’s story of her traumatic first birth, and empowering second birth feature in our book, How to Heal a Bad Birth: making sense, making peace and moving on in the chapter, “I had ongoing physical symptoms after the birth”. My baby was born with her arm up above her head, which resulted in significant tearing to the skin and muscle of my right vaginal wall. My right labia was also torn completely in two. I have undergone three surgeries to attempt to repair my labia, however, all three surgeries failed and my right labia now remains in two separate parts. I also have symptoms of vaginal prolapse (heaviness, bulging and difficulty emptying my bowel) due to the significant damage to my right pelvic floor muscle, which was torn from the pelvic bone during the birth. The skin, nerve endings and scarring of my labia are often irritated or catch on my underwear and clothing when doing simple daily activities such as walking, sitting, standing, riding a bike, going to the toilet or sexual stimulation. Rachael dealt with health professionals who diminished her experience, telling her ‘At least you have a healthy baby’, and even suggested that her pain may have been simply anxiety-related. Plus she found that those around her assumed the symptoms had gone away, once a certain period of time had passed. A few doctors early on after my birth suggested that any repair surgery would be ‘cosmetic only’, which upset me as they were disregarding the pain and discomfort caused by the injury, scarring and misplaced skin/nerve endings. I contacted Birthtalk following the traumatic vaginal delivery of my first daughter. It made a remarkable difference for me in validating and clarifying my feelings about the birth, and to give me ideas on what I needed to do both practically and emotionally to move forward. I recently gave birth to my second daughter and the preparation and birth itself was so empowering and amazing! I spent a lot of time finding a care provider who I felt listened to and understood me (one of the main factors missing from my first birth experience). I felt confident, informed, listened to and cared for throughout the antenatal care. In my excitement I was quickly overcome with the urge to push. I waddled out of the toilet and my husband yelled for help as he could see (and I could feel) my daughters head. The four midwives on duty ran to assist me. I was scared of another bad tear given my previous experience and how quickly the labour was progressing. The midwives were amazing. They were calm and clear in their communication and helped me to calm down and gently birth my daughter. Best of all I avoided a tear! My birth record shows my total delivery time was four minutes after I arrived at the hospital. I really feel like my body just released my baby when I knew I was in a safe place. I am so glad I did not let my previous traumatic experience and injury put me off another pregnancy and vaginal birth as the two experiences were different in almost every way. However, while she was certainly in an improved emotional state, she still had lingering and painful physical symptoms that invaded her everyday life. Will surgery work this time? Recently, she contacted us to tell us that, not only had she had another baby, but she had finally been able to take steps to find a health professional to support her in relieving those symptoms. We have now had our third child, a baby boy. Another empowering birth experience and I was even more relaxed after all the healing that I’d done before the second birth. Six months after his birth, I went to a LONG awaited appointment with an amazing plastic surgeon in Toowoomba. He’d been recommended to me in 2011 following my 3 failed repair surgeries but I was told not to bother with another repair until I’d finished my family. I was so extremely nervous on the 2 hour drive to see the doctor. The idea of going through another painful surgery (and possibly another failed surgery!) was triggering all the thoughts and feeling from my initial traumatic birth. The moment I met this doctor I felt my faith in the medical profession was restored (apart from my Ob for my 2nd and 3rd birth, he was amazing but even he didn’t want to attempt my labial repair as it was unusual and complex). This doctor was so reassuring and validating, I’ll never forget his words “this never should have happened” and “you shouldn’t have had to live with this for four years”. He booked me in for surgery the next week and even bulk billed all costs (which I didn’t expect at all)! It was a nervous week awaiting my 4th surgery. I let the nurse know I was nervous about the anaesthetic as I’d chosen a local rather than general anesthesia as I was still breastfeeding my 6 month old. (Note: In my second surgery I had local but it was not done well and very insufficient for the surgery which added to the trauma I was already in from the birth). The anaesthetist from Toowoomba actually gave me a personal phone call to discuss options and reassure me that I was in control, he would listen and watch me closely and ensure I was comfortable and relaxed throughout. This could not have been a more different experience than my previous one. The surgery went amazingly and after four years of living with daily pain, discomfort and a continual reminder of my first birth I finally felt free. My body is still different after having three kids but it’s no longer “injured” or “broken”. It’s strong, functional and most of all comfortable! I was so proud that I had the courage to go back for the 4th and final surgery. I almost backed out thinking “I’ll just live with it” so many times but it was definitely worth it to finally close that chapter and really feel I’d healed not only physically but emotionally from my first birth. Thank you again for all your support of me and all the women you work with. It’s an amazing thing to work through a traumatic situation, and feeling understood, validated and provided with tools for healing is invaluable. I was crying writing this update – thinking how far I’ve come from that daily reminder to now not really thinking about it at all since the last surgery. It’s been amazing and I honestly don’t know if I would have had the courage to go for another surgery if it hadn’t been for the validation from you at Birthtalk.org, that living with the injury & pain wasn’t right & there must be other options. Finding the right doctor not only with the skills but the care & personalisation of my case (& the anaesthetist too) made it such an empowering experience. We just feel SO happy and glad for Rachael! We love how all the hard work healing emotionally has supported her in planning her subsequent births, and also paved the way for her final surgery, giving her a positive ending to a very challenging and difficult few years. Birth trauma IS real, and it is so wonderful to know that, for Rachael, it has not only been possible to heal the emotional damage, but also find relief from the physical fall-out as well. 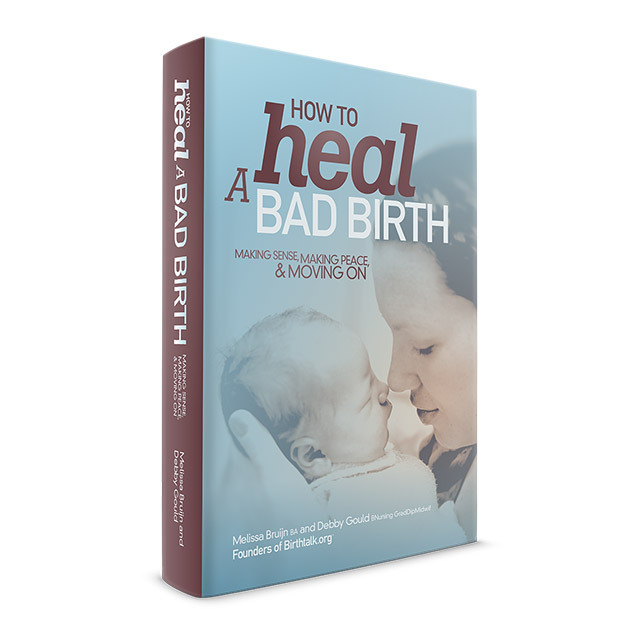 ©Melissa Bruijn and Debby Gould, Birthtalk.org 2017.